The telescreen received and transmitted simultaneously. Any sound that Winston made, above the level of a very low whisper, would be picked up by it, moreover, so long as he remained within the field of vision which the metal plaque commanded, he could be seen as well as heard. There was of course no way of knowing whether you were being watched at any given moment. How often, or on what system, the Thought Police plugged in on any individual wire was guesswork. It was even conceivable that they watched everybody all the time. But at any rate they could plug in your wire whenever they wanted to. According to a patent application filed in January of this year, it appears that Apple is developing a flat panel monitor screen that can see everything in view as well as show you an image. A device comprising: a display area; an array of display elements located within the display area, each display element capable of displaying a pixel of information, either alone or in combination with other display elements; and an array of image elements located within the display area, each image element being capable of capturing visual information from a source in front of the display area; wherein each image element has a lens that does not interfere with any display elements. In other words, millions of tiny image sensors would be inserted in between the tiny LCD display cells that provide little pixels of light. Software magic would assemble a picture from all of the little bits. The application also states that it might employ a variable focus lens using a material that can change its refractive index in response to electrical or magnetic stimulus. The patent also covers both still and video photography. New Apples already come with microphones. Personally, I like Apple computers and equipment, like the Core Duo iMac I'm using to assemble this article. I'm sure Apple would never use this technology to enable a government that suddenly decided that it needed to keep track of everything that its citizens were doing to go ahead and do so. 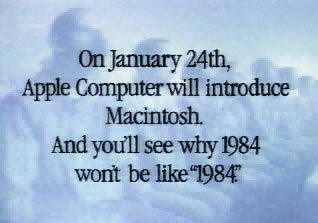 I know this because of Apple's famous 1984 advertisement for the Macintosh. So, let's put a happier face on this. Let's force every government employee (including Congress and the President) to have these new Apple screens. Then, maybe we can find out what's going on.